TO MARK REMEMBRANCE SUNDAY there were ceremonies at war memorials across the area and through out the UK. This is what I saw when I visited the Cenotaph in St Peters Square Manchester later in the day. Further ceremonies will take place on Wednesday, when the recently introduced 11am 2 minutes silence will be observed. Nine First World War soldiers from the Manchester area were given France's Legion d'Honneur. They are: Mike Lally, 104, John Baird 102, Reuben Heywood 99, Percy Wilson 99, Victor Chappell 100, Frank Tipping 100, Tom Tommins 100, Arthur Coleman 98 and John Hamnett 99. And while heroes and survivors of war are honoured, relatives of 306 men executed during World War One for crimes such as desertion, cowardice and disobedience are hoping the men will be pardoned. The campaign is supported by the Royal British Legion and many MP's. AN OPERATION TO TRANSPLANT A KIDNEY from Manchester man Ian Fleming to his wife Teresa, whom he met via the Internet, will take place in Philadelphia today. The case is attracting a lots of publicity Stateside - if you have anything to report, please send a message. We wish Ian, who sent Eyewitness in Manchester an e-mail message, and his bride all the best. And closer to home, Mike Thomas, 40. of Stalybridge is going to donate a kidney to his sister Jane, 37 of Sale. The operation will be carried out at Manchester Royal Infirmary. A BOEING 757 CAME WITHIN SECONDS OF DISASTER ABOVE SADDLEWORTH MOOR - The incident happened two weeks ago. The plane, owned by the Mexican airline Taesa, mistakenly descended to within 300 feet of the highest point of Saddleworth Moor. Air traffic controllers ordered the Captain to climb. The plane landed safely at Manchester and passengers were unaware of the drama. A "Serious Incident Report" was initiated immediately. The mistake may have been caused by a wrongly-set altimeter. AND A GROUP OF PASSENGERS HAVE LAUNCHED legal action for post-traumatic stress after an incident last May in which their plane made a rough landing at Ibiza. The last major accident at Manchester Airport was in 1985, when a Boeing 737 caught fire during take-off. Accidents previous to that were the Stockport Air Disaster of 1967, and the "Shadow Moss" crash 10 years previous to that. The extrame rarity of air accidents ought to reassure us that flying really is the safest form of travel, but I still feel nervous when I get on a plane! THERE ARE SOME AMAZING THINGS GOING ON at the Second Runway site, as highlighted by Kevin Feddy, the MEN's Airport correspondent. An underground lagoon is being created to collect de-icer-contaminated drainage water from the runway. The Bollin is being routed through a special tunnel, with boxes for birds and bats. Frogs and fish have been transported to new sites, and woodland and wetland is being replaced. THERE'S NEVER BEEN A BETTER TIME FOR CHEAP AIR TRAVEL: As featured in recent newspaper ads, you can fly one-way on EasyJet to Nice, in the south of France, for only �, including the government departure tax. Amsterdam is a snip at only �, but the flights are not from Manchester but from Liverpool. Liverpool Airport, which recently announced expansion plans, is more geared up for cut-price airlines than Manchester, but this may change when the second Runway opens in 2000. A MEMBER OF IAN BROWN'S BAND, Aziz Ibrahim, has criticised the decision last Tuesday to throw out the rockstar's appeal and send him back to jail. Brown was "sent down" for four months for threatening a stewardess on a flight from Paris to Manchester, and banging on the door of the flight deck during landing. Ian Brown isn't violent, said Aziz, and his family, as well as fans and tour staff will be badly affected. A reader asked me which prison he's in. Does anyone know? Nine out of 10 MEN readers thought airline thugs should be banned from flying for life (MEN 3 Nov 98). And Liam Gallagher was arrested after a scuffle with a photographer in London on Wednesday afternoon. Photographer Mel Bouzard told police Gallagher broke his camera and hit him. MANCHESTER'S MOST FAMOUS EXPATS The Bee Gees appeared on TV on Saturday night before a star-studded audience, and performed some of their greatest hits - I was playing along with them on my new electronic keyboard. They were in their element, unlike on a recent edition of BBC1's Clive Anderson talk show, when they walked off, because witty Anderson was just being just a shade too flippant for their liking. The Bee Gees were brought up on Keppel Road, Chorlton and also have connections with Oswald Road. THE TRAFFORD CENTRE IS THE STAR of an 8-episode "fly on the wall" documentary by Granada. It's being screened on Tuesday nights at 7.30 on ITV, and is narrated by Urmston-born "Stars in Their Eyes" presenter Matthew Kelly. And on Wednesday, two shoppers were injured when a shop hoarding fell on them. Thankfully, they were only slightly injured, but last month 6 year old Samuel Adams, of Townfield Road, Altrincham, was killed when a bannister hit him on the head. And the management of the Centre scored PR "own goal" on Friday when it emerged that they had banned staff from wearing Remembrance Day poppies. The reason for the ban was because the flowers breached the guidelines on uniforms. By the following day, under pressure from public opinion, not to mention the MEN, the management had withdrawn the ruling. MANCHESTER CITY CENTRE IS FIGHTING BACK against the competition from the Trafford Centre. Mick Hucknall, a noted critic of the Dumplington shopping mall, will be switching on the Christmas lights in Albert Square at 5pm on November the 15th (next Sunday). City centre car parks will be free on that day, and on every Sunday in December and on Saturday the 19th of December. I was present at the switching on of the lights last year - it was great. This year, Santa will be peeping over the top of the town hall, rather than climbing up it, as in previous years, and there will be an Alpine village on the square. I'll be there with my camera! A NEW SHOPPING CENTRE CALLED "THE GATEWAY" IS PROPOSED FOR this rather unpromising looking site next to Cheetham Hill Road. It still has to get planning permission from the Town Hall, but councillors are reported to be very keen - Council Leader Richard Leese said that this and other developments are proof of the vitality of the city centre - despite out-of-town competition. There will be space for 1000 cars, and shoppers will also have direct access from the Metrolink at Victoria Station. The proposal has been made by Frogmore Estates, currently redeveloping the Corn Exchange (alias "The Triangle"). Check out the above scene in a couple of years, after the project is finished! Remember, you saw it "before" on Eyewitness in Manchester. THE CHEETHAM HILL AREA was in the spotlight in the MEN on Thursday - as a location for illegal dumping of rubbish - a photo by Howard Walker showed Irwell St strewn with old mattresses and cardboard boxes. "Is this what the world will think Manchester looks like? ", asked the caption. A few years ago, Manchester was declared "dirtiest city in Britain" and many locals and visitors comment on the rubbish-strewn streets. But a "Clean Up" campaign is being launched, with the Evening News playing a central role. The aim is to have Manchester looking spick and span in time for the 2002 Commonwealth Games. Video cameras are to be used to catch fly-tippers and there will be a general "get tough" attitude. Let's hope it works! MYRA HINDLEY LOST HER APPEAL on Wednesday against the ruling that in her case, "life means life". Successive Home Secretaries have said that the infamous Moors murderer must never be released. But her lawyers are planning a further challenge. 92% of MEN readers thought Myra Hindley's "life means life" ruling was fair. ANOTHER BODY HAS BEEN EXHUMED in the gruseome case in which Harold Shipman, the GP from Hyde, is charged with murdering patients and forging wills. Seven bodies have now been exhumed. The thought that a doctor may have brought about the premature death of his patients in order to acquire their money is deeply disturbing, not least to relatives of the victims, who are reported to be in anguish. A MOTHER AND SON KILLED IN AN ARSON ATTACK were given a US Civil War re-enactment style burial last Tuesday. Jean Trigg, 26 and her son Anthony 5, from Little Hulton died in an arson attack in Clacton, Essex in July. POLICE HAVE FOUND THE HUSBAND OF a woman found dead at her home in Oldham. The body of Sufia Begum, aged 25, was found by her 17 year old brother. She had suffered serious head injuries. He disappeared after the murder, and police had asked airports watch out for him, but he gave himself up at a police station in Middlesex. They will interview him later. FORMER LORD MAYOR OF MANCHESTER John Gilmore has died at the age of 77. He was first elected as a councillor in 1965, and represented the Openshaw ward, later changed to Bradford. 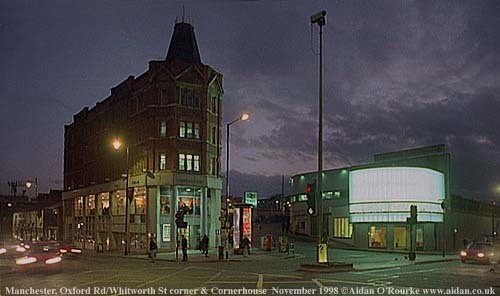 SUNLIGHT HOUSE ON QUAY STREET, MAY BE HAUNTED - Stephen Mera and Colin Wood, members of the Manchester Anomalous Phenomenon Investigation Team (MAPIT), were called in to investigate the building after reports of strange sightings (as featured in an article by Deborah Haile in Saturday's MEN). Security guard Bob Macmillan reported seeing a man wearing an old fashioned jumper, whose footsteps made no sound, and who disappeared through a door. "On the top floor there is this feeling of coldness all the time in the workshop" he says. Built in 1932, Sunlight House seems old enough to be haunted. Are brand-new buildings, such as the Tax Office, off Chapel St, prone to reports of ghostly sightings, I wonder? FIND THE GARDEN OF EDEN IN SALFORD - This was the message in an article by Neal Keeling in Thursday's MEN, which stated that actually, Salford does have some good things to shout about. These include Salford Quays, and the many companies including Century Radio and Barclays Bank, who have opened offices in the city. The new Tax Office on Chapel Street and Magnesium Chloride in Clifton are other examples of new developments bringing employment opportunities. But Broughton, Langworthy and Ordsall still feature as problem areas, and one unnamed police officer thinks some criminal families there are "out of control". But if anyone asks you for directions to the Garden of Eden, you'll find it at Apple Tree Court, Pendleton, where tenants have created a garden with special seed and a wildlife reserve. Hmmm, I'll have to look into that one! THE CURRENT EWM TEMPERATURE (5pm Tuesday 10th of November)is 50 fahrenheit, 10 celsius. Outside, it's been a mixture of sunshine and clouds, with a rain shower earlier in the day. The weekend was unexpectedly pleasant, bringing blue skies. On Sunday, I visited Clifton Country Park - I only found it by accident, as it isn't marked on the map. The lake was created when earth was dug up building the M62 (now M60) motorway, which spans the Irwell further down the valley with a mighty, but rather bland-looking bridge. Sorry again for the delay in bringing the Newsletter to you this week, and please keep sending those e-mail messages! PLEASE BROWSE THE LATEST EYEWITNESS photos, from eighty-one through ninety-six. There are some moody monochromes and semi-monochromes, a retouched Manchester Cathedral, a cleaned up Rochdale Canal at Newton Heath, an autumnal Northenden Parish Church, and some more rooftop views taken round Manchester city centre. The Image Collection has now passed the 600 mark! Subject: Eyewitness is fantastic for all us "Ex Pats"
Thank you so much for your Eyewitness photos for Manchester Online. My husband myself and the two kids emigrated to Canada five years ago. I just can't believe the changes that have taken place in the Manchester area! Could you possibly include photos from the Beswick area of Manchester. My Mum, Dad, sisters and brothers still live there. Although it is nice to chat with them on the phone, it would be nice to see how the area has changed since we left. I feel your section is especially appealing to ex pats. Keep up the good work, and once again, thank you so much! I'm quite interested in the Beswick area, it's got a lot of industrial history, though not much of it is visible nowadays. Could you give me the name of the street where they live, and any other locations in Beswick you think you, and others, would like to see? I ask this as I've discovered many interesting places thanks to my readers' requests! "... will perform the big switch-on in Albert Square at 5pm on Sunday the 15th, celebrating a new Santa on the Town Hall roof and Alpine Village in the square below." About the Trafford Centre. In time, after the novelty has worn off, the centre will not be able to compete with the centre of Manchester. We have the Ontario Center about 65 miles east of L.A. a lot of people have been there once. It's silly to drive for hours just to shop. Especially when you can get everything locally. Manchester is wise to offer free parking on those special days. Here in Burbank Parking is always free. Next door in Glendale, the City Parking Lots (we don't have car parks here, if we did that would be where cars would go to play!!) charge a fee..
Yup, I agree with all that, and I'll be there on the 15th with my 1600 ASA film to grab those fireworks, like last year. Dear Aidan, Good morning from Adelaide South Aussie, just wanted to say hi and love the revamped site. We were in touch last year when you did the ex pats for the tv and you got in touch with my brother who lives in Audenshaw. I get great pleasure in visiting the site and having to explain to my Aussie partner the location of the photographs although a lot has changed since i left in 1964. Keep up the good work and have you any pics of Audenshaw or Longsight. Yes, any specific streets or locations? In the new Eyewitness website, there will be maps, so you'll find it easier to plot the exact location. Thanks again, and keep visiting. This is a quick note to say how impressed I am with the web page. I've lived in London for just about 15 months now but still miss Manchester dearly. The photos are good and bring back many memories. Please keep adding more to the collection. I lived in/near London for a while, and after 12 months couldn't wait to move back to Manchester again. I like to visit London from time to time, it's a great place, but to live there? For me, the cost of living and practical difficulties of getting set up there outweighed the benefits. At least you're only a comparatively short distance away - spare a thought for all those far-flung expats. You can fly, drive or take the coach or train and be home in a few hours, but wouldn't it be great if you could hop on one these (right) and be home in 20 minutes! I stumbled across some of your photographs and I must say I am impressed, and hopefully I will be back. I hope so too! Nice to know people in London are viewing Eyewitness in Manchester. Thanks for all your great work in and about Manchester. You have a great job in a great place! I am a native Californian, I work and live in San Francisco for a UK-based organization. 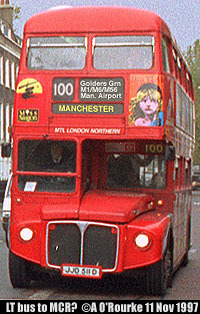 Lucky for me, I have had the chance to visit Manchester on several occasions. Your comments on Salford were especially appreciated as I agree with you about its "desirable areas". There used to be a wonderful plant conservatory in Buile Hill Park. The last time I saw it, it had been closed for a few years as well as neglected and vandalized. Recently, I was told the Council was to restore the conservatory. Any truth to it? Would love to see it in the Image Collection. Thank you Aidan for providing contact with "home" (ie Salford) to Perth Western Australia. Your site is excellent. Can you tell me if the "Salford City Reporter" still exists ? I have tried to find it on the internet without success. Cheers Jack. Subject: MANCUNIAN OF THE YEAR? Aidan, "cumoffit", stop being so bashful. Just give us (internet ex-pats) an e-mail address, and we'll really let them know. I am sure I speak on behalf of "millions" (other United fans), as well as the three remaining City fans.... but even Alex will finish up a distant runner-up (again :-( ) to the one & only Aidan O'Rourke. Thanks very much for the praise - but Mancunian of the Year? No, definitely not! There are far worthier candidates than me! I do this for for my own pleasure, and it just so happens that other people seem to like it as well. Superb pictures!! I live here in Manchester (Didsbury) - it's just the best place in the world and it's great that someone is putting photos of it on the net for all to see! Thanks, nice to know people are accessing Eyewitness in Manchester from as far away as... Didsbury! 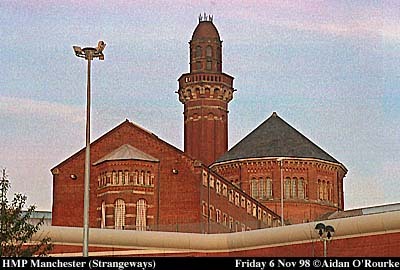 "Here and Now" is a Manchester-based programme. Strange then that they represented young and hip Manchester, with a man who seemed about 100, stuttered his lines shamefully and when he did get them out didn't even have a Manchester accent, but what seemed like a broad Burnley accent. It's a bit like representing a cockney accent with a farmhand from Somerset, because "it's near enough". It's about time the producers at Granada found a few Mancunians for Coronation Street too. What all these thick Yorkshire and Lancashire accents are doing in a programme set in central Manchester is a mystery. Les Battersby's about the only Mancunian in it. Never believe what you see, when a slow-witted southern producer is asked to represent contemporary Manchester.